TPWD helps anglers get access to fish’s favorite stomping grounds. Nol Dear lives on a bend of the South Llano River outside of Junction. She can’t imagine a better place to be. Her property adjoins the river crossing on County Road 150 a few miles upstream of South Llano River State Park. It was a family camping spot when her kids were growing up, a place to kick back and take a break from city life in Houston. Today, under a lease agreement with the Texas Parks and Wildlife Department, Dear provides a small parking area for anglers who want to launch canoes or wade-fish the South Llano at the bridge. 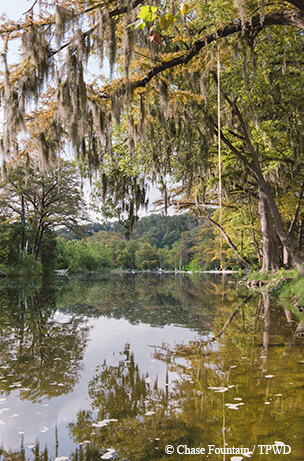 TPWD pays a fee for use of the land so visitors have a legal place to park cars and boat trailers while they enjoy the water. Dear’s place is one of a dozen River Access and Conservation Areas leased from private landowners by TPWD. The program is funded in part by the federal Voluntary Public Access and Habitat Incentive Program (VPA-HIP), authorized by the 2011 and 2014 Farm Bills. Along with the South Llano, leased areas offer access to the Brazos, Colorado, Guadalupe, Neches, San Marcos and Llano rivers. Leased access is one of the tools TPWD is using to address the general lack of access to our state’s rivers. By law, all navigable streams are public waterways, open to citizens who want to swim, wade, boat and (with the appropriate license) fish. In practice, much of that water is inaccessible to the general public because the vast majority of adjacent land is privately owned. Alvin Dedeaux, who guides fishing trips on Central Texas rivers, cites the Colorado as one example. Maps, directions and details on each River Access and Conservation Area are available on the TPWD website. 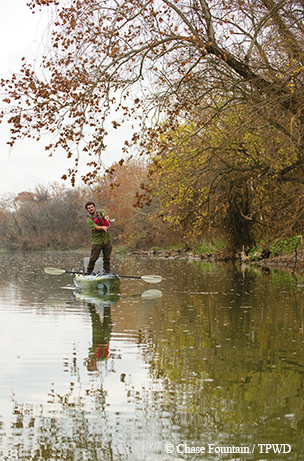 Interest in river fishing and paddle sports has exploded in the past 20 years. Existing public parks and right-of-ways have seen heavy use. Conflicts with riverbank owners have become common. The couple currently owns and manages the San Marcos River Retreat. They signed a TPWD public access lease last fall. Some hard-to-reach, seldom-visited stretches of river offer clean water, healthy fish populations and breathtaking scenery. Tim Birdsong, chief of habitat conservation for TPWD’s Inland Fisheries Division, is aware that some landowners would prefer to keep things just the way they are. However, he believes public visitation, with a focus on responsible stewardship, is best for rivers in the long run. “If we can get people out there, give them a chance to enjoy our rivers and streams, hopefully we’ll build a desire to conserve and protect them,” Birdsong says. 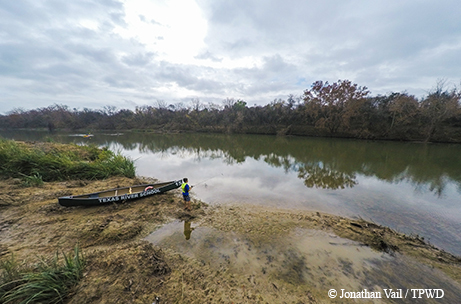 East of Austin, the Texas River School provides an access point on the Colorado River for anglers and paddlers. The VPA-HIP program offers grants to state and tribal governments to encourage public recreation on privately held land. It’s meant to be a win/win scenario, providing income for rural landowners and opportunities for outdoor enthusiasts who aren’t lucky enough to possess their own spreads. Money from the program can be used to lease land for hunting, fishing and other wildlife-dependent activities. It can help pay for fences, trails or habitat restoration. Funding comes through the U.S. Department of Agriculture. Since 2014, the Natural Resource Conservation Service has administered the program. Like many other states, Texas uses part of its grant to support public hunting programs. Only a few states have written plans that specifically address river access. 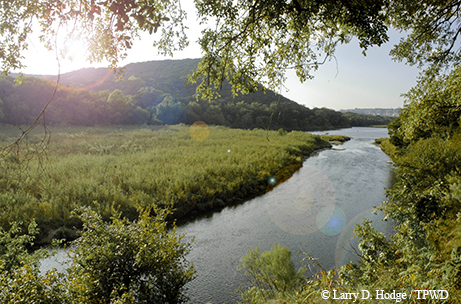 Texas River Access and Conservation Areas, in most cases, are quite different from parks. They tend to have few, if any, staff on hand. Amenities such as restrooms and running water may or may not be available. Phone reception could be spotty. Some sites require advance reservations to avoid overcrowding, or to supply visitors with the code that opens a gate. Don’t expect a groomed landscape. In fact, TPWD’s river access team encourages landowners to leave banks in a fairly natural state. The typical lease agreement allows fishing from the bank and launching of nonmotorized boats. Other activities, such as camping, are allowed at some sites but not all. Although the program pays owners for public use, it’s still private land. Visitors are, in a sense, guests, and hosts are allowed to make some rules. Sustainable use is built into the program. TPWD has contracted with Texas Tech University to assess fish populations and riparian systems at proposed and existing lease sites. The department is also working with volunteer groups to plan public service projects in leased areas. Russell Husted is president of the Texas Council of International Fly Fishers. Affiliated clubs have offered support, even suggesting names of landowners who might consider a lease. Maps, directions and details on each River Access and Conservation Area are available on the TPWD website at tpwd.texas.gov/fishboat/fish/recreational/rivers/ Here are some highlights. A 30-mile stretch of river between Lake Whitney and Waco had essentially no public access before the Brazos River Nature Center opened in 2012. This lease consists of two areas, five river miles apart, on the east bank near the town of Gholson. It isn’t the kind of nature center where you’d take a kindergarten field trip. There’s a high-clearance road to a parking pasture, a portable toilet and a short hike through tangled vegetation to a gravel beach. To Husted, however, the place is an angler’s paradise. Husted likes to launch a kayak at the south location and paddle upstream about two miles. “That section probably has more big bass than anyplace else in the river. I can usually catch 6- or 7-pound fish on a fly,” he says. If black bass don’t float your boat, there are crappie, white bass, catfish, gar and big sunfish. Jeb and Angela Burns own the property. Their site rules say no pets, no fires and no loud radios. They want to keep things quiet and peaceful for serious anglers like Husted. There’s no road to the north section; it’s accessible only from the water. The south section has a gate at the land entrance. Visitors get the entry code when they call ahead. Texas River School’s River Camp is in East Austin, five miles downstream of Longhorn Dam. The nonprofit Chautauqua Foundation owns the camp and school. When the foundation bought the property, it was an unofficial garbage dump. TPWD signed it as a river access site in 2012, and some of the habitat restoration money paid to clean up the area. “We removed 700 old tires and 200 tons of trash,” recalls Joe Kendall, founder and executive director. Chautauqua’s main mission is outdoor education, particularly for underserved populations. The school plans river trips for urban youth groups. Scout troops use the campground and canoe launch to train for longer trips. Individuals can use the place under the TPWD lease; Kendall reports roughly half a dozen takers each month. It’s one of the few leased areas that allow overnight stays. There’s a self-registration station and two environmental toilets. As with the Brazos River site, visitors (camping or not) need advance reservations. Last fall, TPWD signed leases on two day-use sites downriver near Smithville. The new spots don’t offer many amenities, but they’re less than a day’s paddle from public takeout sites downstream. TPWD’s first fishing lease predates the VPA-HIP program. Each winter, the department stocks around 20,000 rainbow trout between Canyon Lake and the city of New Braunfels. Since 2006, it has made deals with privately owned Camp Huaco Springs to allow free bank access for trout anglers in season. A ribbon of pavement called River Road winds through the area, crossing the river at several points. The road is lined with fishing camps, canoe and inner-tube liveries and vacation resorts. Plenty of places have access to the water, but they’re in business to make money, and they charge for use of their facilities. The only real public access is a small Corps of Engineers park at the foot of the dam. Since 2011, VPA-HIP grants have helped finance the Camp Huaco lease and others in the River Road area. This year, some leases will extend into spring. Free angler access is available through May 4 at Whitewater Sports, Rio Guadalupe Resort and Mountain Breeze Campground. Chandler River Park differs from other River Access and Conservation Areas in several respects. Although situated partly on private land, it’s managed by the City of Chandler. TPWD isn’t paying rent on the place: a local nonprofit signed a 20-year lease with the landowner. The department supplied grant money for an interpretive kiosk, paving material for a new parking lot on the north side of Texas Highway 31 and a fence to keep the landowner’s cattle off the riverbank. 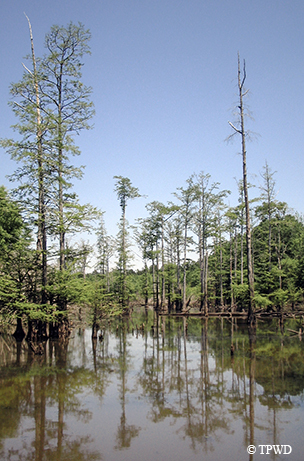 The expanded park straddles the highway on the west bank of the Neches upstream of Lake Palestine. “This stretch of the river is known statewide, or at least regionally, as the place to go to catch sand bass in the spring,” says City Administrator John Taylor. Six years ago, there was a one-lane boat ramp with a small parking area on the south side of the road. When that filled up, eager anglers would park wherever they could. “There were 50 cars up and down the highway. We needed a parking lot, and we needed land to put it on. Also, fishermen were getting into conflict with property owners,” Taylor says. Since the new park area opened in 2012, the city has found funding sources for other improvements. There’s a paved walkway under the bridge, a new kayak launch on the north side and an 8-mile Texas Paddling Trail opening this spring. In a way, this river access area has put a new face on that side of town.